I love beans. Sometimes, I think beans get a bad reputation. Sure, they make you musical and you can start your own band, but they also have the magical power to clean you out and fill you up. Not many foods are like that. 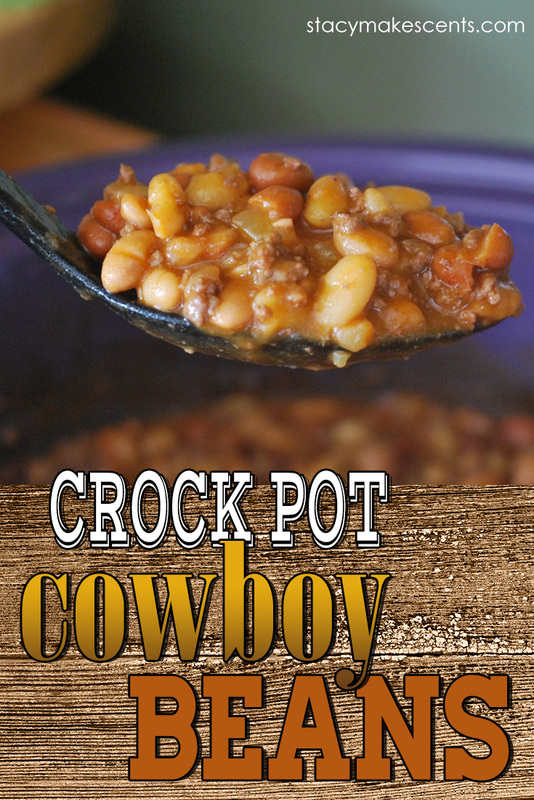 Let’s make some Crock Pot Cowboy Beans, y’all! 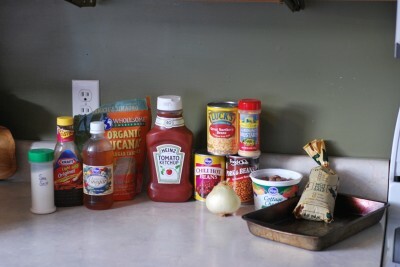 You need ground meat (I used venison), 4 cans of various beans, onion, sweetener, barbecue sauce, ketchup, dry mustard, vinegar, and salt. Now, I used some canned beans and some frozen beans. I’m trying to use up a lot of my canned beans so I can make dried beans in the crock potand freeze them instead of buying canned. I think they taste better and they’re a WHOLE LOT cheaper. In total, you’ll need about 6 cups of beans. One can of beans is equal to about 1 ½ cups. The best part about this recipe is that you can use whatever you have. 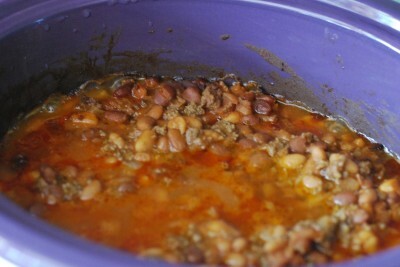 I used Great Northern Beans, Pork-n-Beans, chili beans, and pinto beans. If you have all of one type of bean, go for it. Or if you have black beans or lima beans, those work too. Anything goes…..and these go too…….fast. 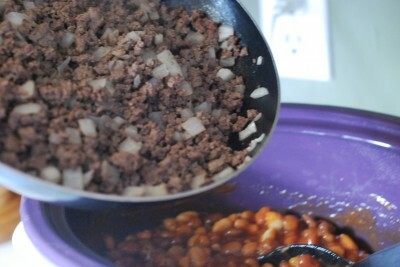 Grab a skillet and brown your ground meat and onions. Every time I use this skillet I dream about replacing it with cast iron enamel. Ahhhhhh. I think I might have an obsession with kitchen pots, pans, and skillets. And glass jars. Have I mentioned that? You can drain your meat if you like. 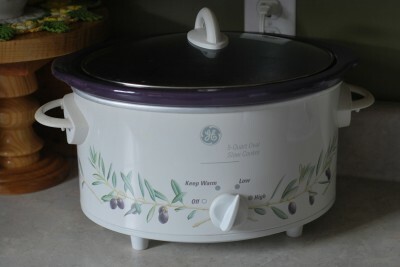 Spray or butter your crock pot. 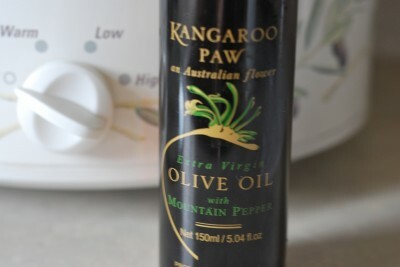 I found this olive oil spray at the store and I’ve been using it. It’s unique…..and I’m trying to use it up. Butter is better. Better butter, better butter, better butter. In the crock, mix the beans (NOT DRAINED), sweetener (you can use honey if you like), barbecue sauce, ketchup, dry mustard, vinegar, and salt. I also added pepper but forget to mention it above or take a photo. Oops. I’m really on top of things. When your meat is done, pour it into the crock with the other stuff and give it a good stir. Put the lid on and cook on low for about 4 hours. It will let the flavors really mingle and learn stuff about each other. Beans are not wallflowers. I have a lot to learn from beans. Beautiful! Tasty! Gone! These went fast. Our family loves Cowboy Beans. These are excellent to make for a crowd (and very cost effective) and they’re also a good dish for freezer cooking. Make up a crock or two of these and a few batches of cornbread and you’ll have some happy visitors. One batch is about 8 servings. 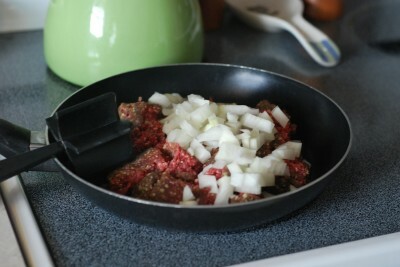 Brown ground meat and onion in a skillet. Drain if desired. 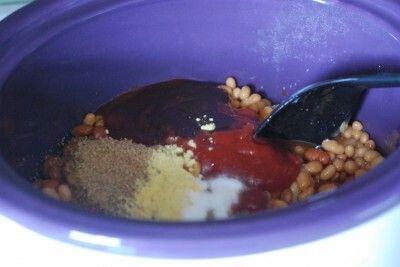 Combine beans, sweetener, barbecue sauce, ketchup, mustard, vinegar, salt and pepper in the crock. Stir in browned meat and onions. Serve piping hot with cornbread. My recipe is almost the same! Mine includes a pound of cooked and crumbled BACON! Add it to yours. I’m sure you will love it? I make these but also add 5 smoked sausage, fried then chopped up and added to the pot. Yum!! went to the store today for this meal just as my luck out of dry mustard hope french’s mustard works just as good ??? what is the best can of beans i like bushes ? Stacy, I was looking for a recipe for Cowboy Beans and was thrilled when your website popped up. This looks great. I think I’ll use navy and northern beans. They need to be soaked overnight before making this, right? When I first saw the picture of your Cowboy Beans, I thought there was corn it it, but what i was likely looking at was a white bean. But it made me wonder … would corn go good in this recipe? Thanks so much for the lovely lunch last week. I really want that chicken crock pot soup that you served. I really liked it. Thank you again! Elizabeth, I’ll be posting that recipe on Friday. 🙂 Thanks for coming over! They are YUMMY! Great potluck dinner too. 🙂 Good job Becca! Stacy, I just looked and washed 2 pounds of pinto beans and put them out to soak. Tomorrow, while I am baking banana bread to freeze I will put them in the pressure canner and can them. Have another 2 pound bag to do late in the week. I do some in quarts and some in pints. That way I’ve got it covered. When you want beans but don’t have time to cook them low and slow so the juice thickens a little, just pull out as many as you need and voila, pinto beans! I was wondering if I could use baked beans also in this recipe. I have pinto, pork and beans, and baked beans here at home and was wanting to make this tonight. Oh and can you fix biscuits instead of cornbread? Biscuits would be great! We’re just lovers of cornbread. 🙂 And you can use any type of beans you like, even green beans. Good luck! Ohhhh my grandma used to make these and I’ve been looking for the recipe! It’s so good! Thank you! And yes, I freeze beans often also..they do really well! Stacy – love your blog! First let me say I love beans too! LOL, but the downside is, I’m the only one in my family that does. Brad doesn’t like them, nor does Peyton. Anyways, with that being said, if I were to fix the cowboy beans, I will have a lot to freeze over, but I don’t see how when you freeze them, and then you re-warm them later, how they’re not turned to mush…. Becky, I freeze beans all the time. 🙂 If they are already overly soft, then they could get softer. When I know I’m going to freeze beans, I try to under-cook them just a tad. But for these I would just freeze them, then thaw in the fridge. After that, I would heat them up on the stove-top. Elizabeth: I HATE beans. But on a whim I tried these at a wedding. Granted I can’t say the exact recipe considering it was a catering service, but I LOVED these and went back for seconds. Stacy, thanks for the easiest/cheapest recipe I’ve found yet. While I can’t say I’ve made them, yet, I will definitely be testing these out for a work “BBQ” potluck! Hello! Saw you on TV this AM sharing your cleaning secrets… Great job! I saw you at MPS and enjoy reading your blog and experimenting with all your ideas… You go girl!